The reason we see content as number one, is because CONTENT is what got that visitor to click “your link” after seeing their search result. 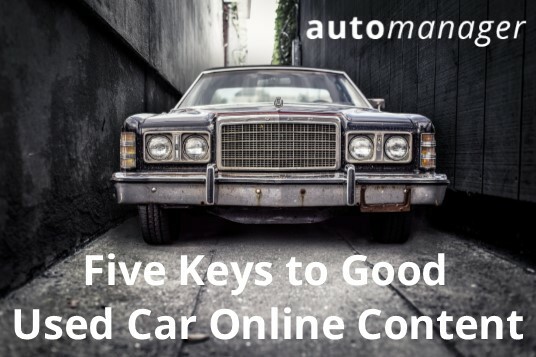 USED CAR DEALER content is also important because it is important to Google. Good content signifies that the information being presented to the visitor is valuable. What does valuable content look like? Well, it is not always self-promotion and it is not always trying to sell, sell, sell. A great immediate benefit to you is that there is a wide array of great material that relates to used cars you can use for your used car dealer website. Creating content that is intended to inform, educate, draw awareness, and influence visitors needs to be relevant. A good question to ask is will this information be beneficial to the reader? Google frowns on a website that is not mobile friendly (responsive) and that does not load fast enough. It is likely you will lose audience share if they have to sit and wait too long for a page to load. You will also lose visitors if they are having a hard time navigating your website. These customers have many options and catering to their perspective is a wise consideration. It’ll be a great service to you if you have a fast intuitive dealer DMS when it is time for the deal. Also very helpful will be to have a good CRM so you don’t lose touch with them, as well a stunning dealer website to entice and encourage engagement. A really great takeaway to these 5 important elements of a good online experience would be to consider your own online experiences. What device are you using when interacting with the internet? Do you stick around when a page takes a while to load or is tough to navigate? If you were looking for information and instead were being given a sales pitch what would you do?